The average interest rates for conventional 30-year fixed rate mortgages jumped from 4.27 percent in July to 4.49 percent in August according to the Federal Housing Finance Agency’s (FHFA) Monthly Interest Rate Survey, an increase of 22 basis points. The increase in August follows July’s increase of 51 basis points. The results of the survey reflect loans closed during the August 27-31 period from 26 lenders and data from 6,492 mortgage loans. Since mortgage loans typically take 30-45 days to close, the reported rates reflect market conditions in mid to late July. 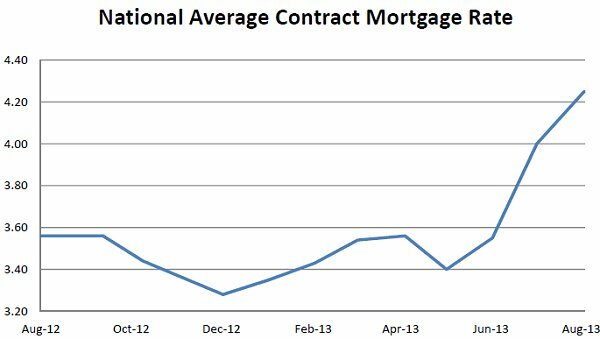 The National Average Contract Mortgage Rate for the Purchase of Previously Occupied Homes by Combined Lenders, used to index some ARM contracts, increased to 4.25 percent from 4.00 percent in July. The effective mortgage interest rate, which includes initial fees and charges over the first ten years of a mortgage loan also increased, climbing to 4.40 percent from 4.12 percent in July. The average loan amount for a 30-year fixed rate mortgage was $274,500 in August, down from $278,200 in July, a decline of 1.3 percent.